Up until a few years ago, I barely ate salad and even today it has to be something special to grab me. 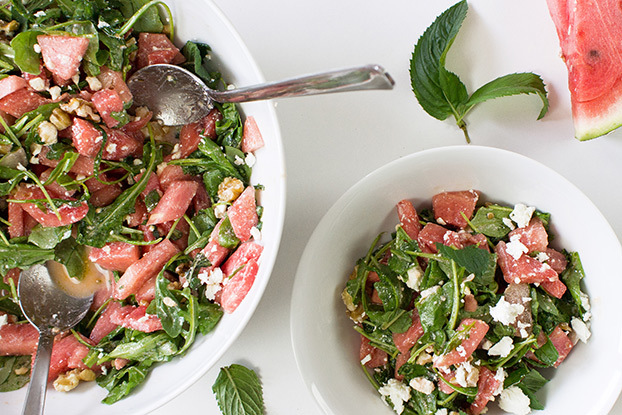 This watermelon and feta salad is something special. It goes without saying that watermelon and feta salad is perfect for the summer when watermelons are at their sweetest and juiciest – and cheapest, too. There’s something about this recipe that sparked my interest from the very beginning – it was sent to us from Spain from our Spanish chef and friend, Cristina Parés. 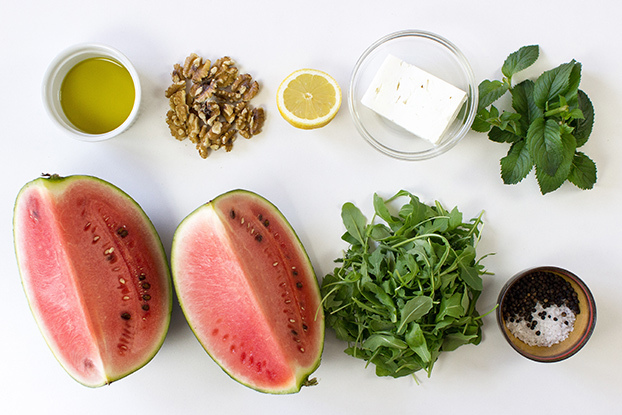 What makes Watermelon and Feta Salad so tasty? If you stripped this salad down to its bare essentials then you wouldn’t expect the finished product to be so good. 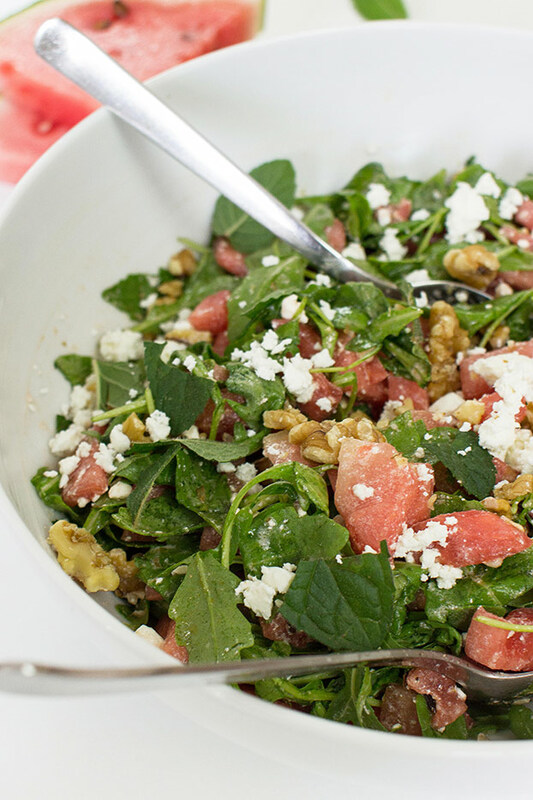 Watermelon, feta, arugula, lemon, walnuts and mint – simple enough, right? But mix it all together and you’ve suddenly got something that stands out from the crowd. 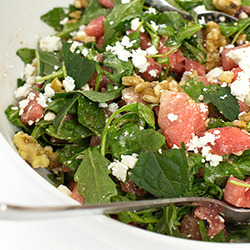 Arugula (or rocket) has that slight hint of bitter that is offset by the juicy, sweet watermelon and mint leaves, while the lemon brings the best out of the feta. Of course, a salad like this shouldn’t be all soft, either, and walnuts give it the perfect bite. We do have a sneaky reason for bigging up watermelon salad too – the evidence that watermelons are absolute heavyweights in the healthy-eating world is really stacking up. Watermelons contain a huge range of phytonutrients that are needed by our bodies – and could have a huge impact on our anti-inflammatory, antioxidant and cardiovascular systems. See here if you’d like to dig a little deeper. Talking of heavyweights – when you’re picking your watermelon, go for the heaviest one (when comparing to others of the same size). More weight means that the melon is riper, and therefore more ready to be eaten. Look for the yellow spot on the outside too – a creamy or yellow spot is much better than a white one. Still need more help? Try this helpful guide to picking the right watermelon. If you’re buying a pre-cut watermelon, look for a nice, deep red colour, preferably without white streaks. Got your watermelon? Right, on to the recipe! 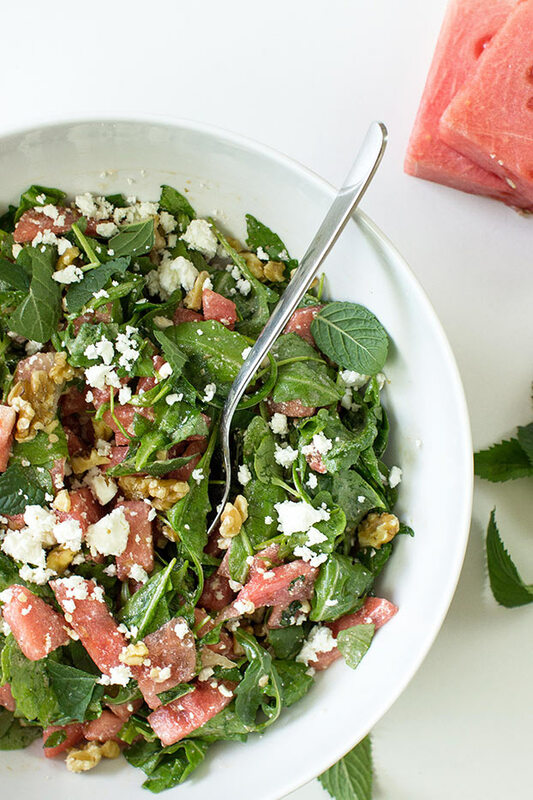 This exceptionally quick and easy watermelon and feta salad is also incredibly tasty – and we even include a guide to picking the right watermelon! Cut the watermelon into small cubes. Here’s an easy way. Give the arugula a good wash to get the sand/dirt off it. Crumble the feta cheese and add that, too. In a separate bowl, mix the olive oil with the salt and pepper, add the lemon juice and zest and the chopped mint leaves. Dress with the olive oil and herbs mix before serving. Need more salads?! Check out the evergreen chickpea salad for an awesomely quick and tasty lunch, or this pear and mustard salad for one with a unique twist! Watermelon and feta makes a wonderful flavor combo, the first time I tried it surprised me, but now I’m all in for it! Thanks for this recipe!